Thanks for hosting Australia Day at the TCC! 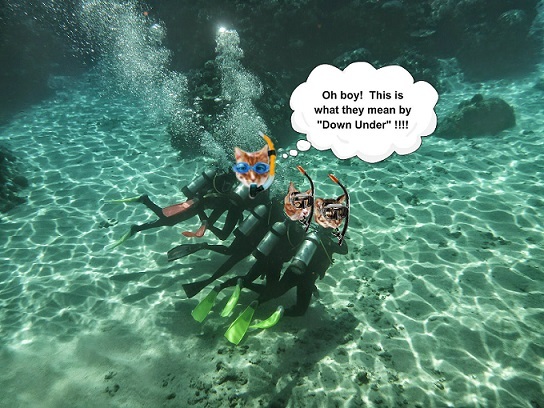 There are a bunch of cool posts up already – we hope you and your beautiful country have a PAWSOME celebration of all things “Down Under” today! We had a blast for Aussie Day and Gracie extended it for another day so we’ll keep snorkeling and having some fun today!!! We’re quite caught up with Australia right now with the tennis – great that it coincides with Australia day – so much to celebrate. You look so comfy in that pouch – what a way to travel! Not quite as comfy as traveling with Animal Couriers but a pouch will do in a pinch!!!! I would love to join you down under Sammy. I think it’s a great place to be right now. I agree….they have summer – WHAAAAAAAAAA – we have snow – BOOOOOO! Cool that it is Australia Day and those are some very cute pictures you did Sammy! I like the conga line and you in the pouch.. awww! I found out about Raz’s Dad last night and sent him and his Mom prayers.. thank heavens for caths! Good Morning! *sent his Dad and Mom and Raz prayers! Thanks for that Miss Pix……he’ll have his cath today and then everyone can breathe that proverbial “sigh of relief” !!!! Yes! I was just thinking about him. He is in my prayers but I know firsthand the magic of stents and know he will be feeling so much better! Hi Miss Pix! 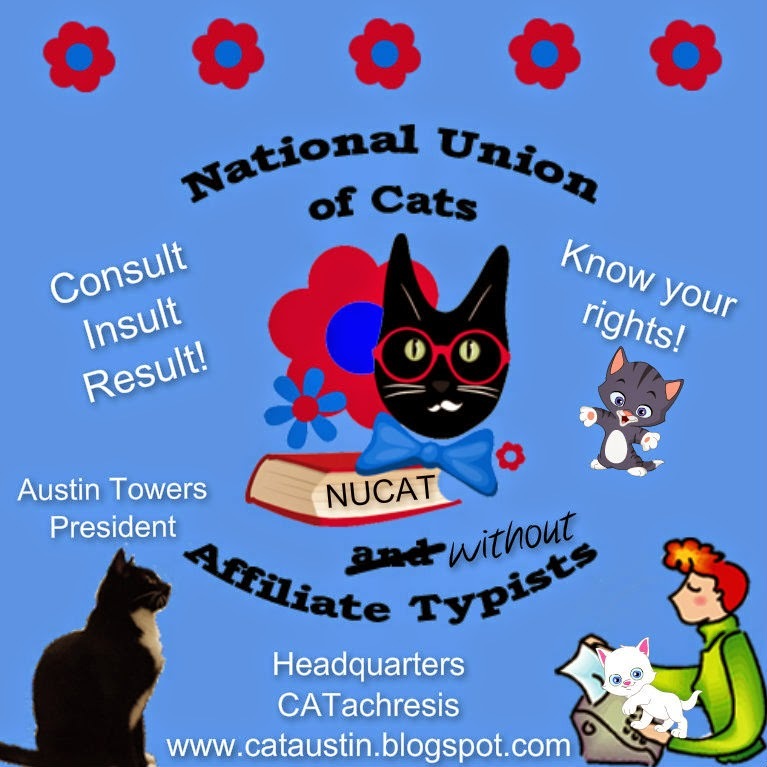 Yep – Australia Day will be fun – there are already a bunch of cool posts on the TCC……Hope to hear from Raz’s Mom that the cath is FIRST THING and then hear that he’s back in his room and all is well – – – I hate WAITING! Glad you enjoyed it! And I hope you enjoy the beach (gosh that sounds good!!!!!). Happy Australia Day to all our friends Down Under! You make a very cute Koala. I am purring hard for Raz’ dad and me and mum send our good wishes to all his family. 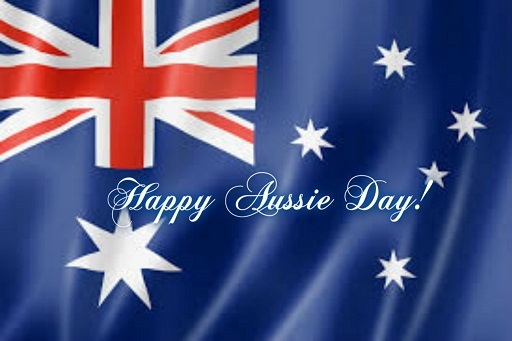 Happy Australia day to all our buds and buddetts Down Under!! Sammy that is one fine conga line indeed and your appearance put it over the top. Mom and I are purring really hard for Raz’s dad and we will be anxiously awaiting news. Cute photos of you celebrating Australia Day, Sammy! Thinking of Raz and his family and hoping for good news about his Dad. How super that it is Australia Day. happy celebrations to all! 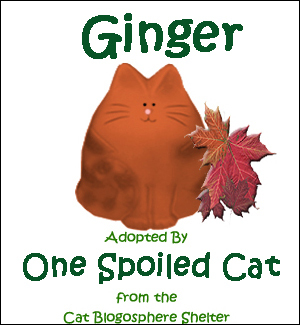 We have revved up the megapurrs for Raz’s dad and are purraying that he will be home soon and more comfortable!! We made EACH OTHER chuckle……I read your blog first thing and I love starting off with a smile!! WOO HOO!! Just found out Raz’s Dad scheduled for 3PM cath – guess they’ll have to wait a while since it’s only 9:30AM! Why does Raz’ dad get a cat-ether? He already has Raz. Excellent question Kismet……it’s one of life’s little mysteries…..I should think Raz is more than enough CAT for anyone! This is GRRRREAT…. WE do love our AUSSIE Furends…. and we are wishing them HAPPY STRAYA Day ! We love our Aussie friends too…………!!! Love the photos, Sammy. Happy Australia Day! I think all our friends from Down Under are glad so many friends of theirs pawticipated today! MOL! You sure know how to celebrate Australia Day, Sammy! It’s a fun event at the TCC !!! HAHA – don’t say “losing” at the Teaser because who knows – this might be the one you know!!!! 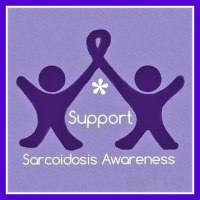 It will pop up at a random/secret time – it’s already scheduled to go……! Raz and his family will appreciate the POTP! Happy Australia Day!! Sammy, you are sensational as an Aussie. 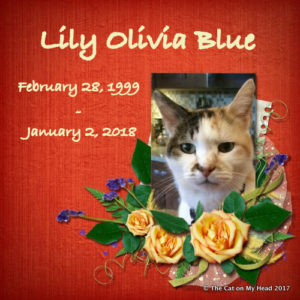 Raz and family are in our prayers, purrs and crossed paws….remember TPOTP friends. Thanks! It’s fun being an Aussie for the day! Raz’s Dad is scheduled for 3PM and t’s almost 2:30PM so hopefully it’s on time….I know everyone will be glad when it’s done and Raz’s Dad is back resting in his room. Happy Australia Day. Sounds warmer than here and no snow. Sending prayers for Raz’s dad. We’ve had light snow off and on all day and tonight I think we’ll have some more…..no biggie – up north it’s nuts with snow though – STAY WARM AND STAY SAFE!!!! Great photos Sammy! We are praying for Raz’s Dad. POTP is powerful stuff and they need it more than ever now – he’s going to have bypass surgery Wednesday or Thursday! LOL over Sammy as a joey! Love our Aussie pals and so envy their summer while our big storm brews. Stay safe. Miss Layla we hope you all are safe and have power, etc. It looks TREACHEROUS on the news up there in NY! Take care and we’re sending hugs……..warm ones! Hee-hee! We got a real giggle out of you as a joey too, Sammy! Bet that kangaroo got a surprise too! Here-hee 🙂 You did great. We got POTP going big for Raz and Allie’s Dad. Hi Kwees!! I made a rather cute ginger joey didn’t I? And the conga line was tons of fun! Raz’s Dad is having BYPASS surgery Wednesday or Thursday instead of another stent……..POTP full speed ahead! 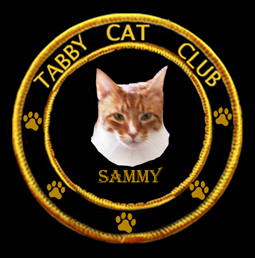 Yur adorable Unccle Sammy…beeinn all Rooey an stuff!! I bet you’d enjoy riding around in a roo pouch too Siddhartha!! 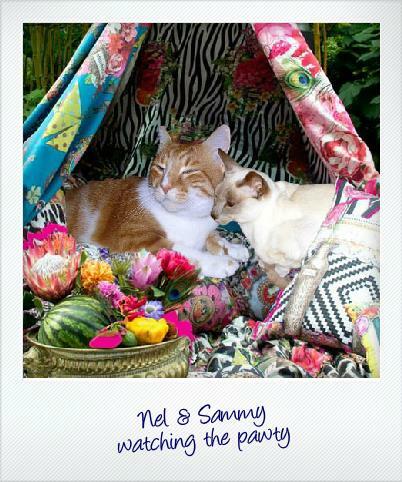 You are so cute with your pals Sammy! Happy Austrailia Day everyone! Thanks Brian! It was tons of fun “Down Under” ! Tuesday teaser sure sounds like fun! I’ll try to remember to come over and have a go. It was a lot of fun pawticipating in Australia Day on the TCC – in fact, it’s going to go on again today since it was so much fun! The flag is a nice one – I love it…….and you! We got there late to the barbie, but we got there Sammy! You look like you had a blast while you were on walkabout !!!! Hope we don’t miss the teaser today. Mom is off to get ready for work. I will make her check before she leaves the house. Hi Marty!!! We’re continuing the Aussie Day on the TCC into today because it was so much fun yesterday!! WOO HOO!!!!! Teaser is up and running……where are you?!?!?! Loving your Ozzie day celebrations! HAHAHA….it was a great idea to have an Aussie Day – and such good participation from the TCC too!! Yep Sammy it sure wuz. Specially wiff all da cold weez all havin’ here. MOL Oh Sammy, surely yous not wanna spend Valentines day wiffouut yous sweetheart. 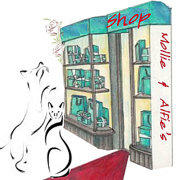 Meez sure ifin yous told hers ’bout it she wuld fur sure ask ya’ to be hers date. MOL Oh Sammy meez sure Sundae will wwant to be wiff you on Valentine’s day of all days. We can’t hawdly wait. I have to comment again now that I can properly. It was a thrill to see your post on aussieday and than you for doing it. When I was a kid I always wanted to travel by roo. LOL. That was a lot of fun – we had a ball on Aussie Day. 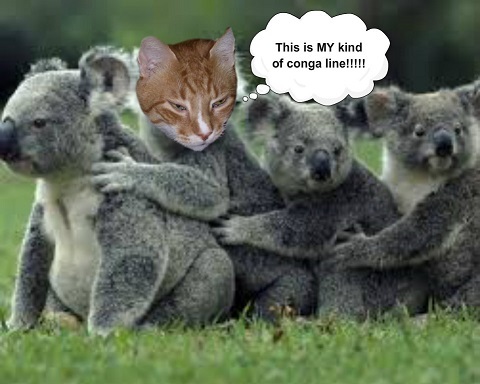 I liked being in the Koala Conga line too!